Decoration Accessories: Decoration accessories are a major segment and cover almost everything required for decoration. The segment might include crystals, candles, curtains, garlands and a huge array of other wedding props. Chandeliers: Chandeliers are the most important and significant thing in your wedding and looks very attractive with proper use. Marriage planners can provide a huge variety of chandeliers. They also know that chandeliers are efficient and effective in use. Any solemnity under the lights of a crystal based designed chandelier is prominent and indelible event. Wedding Props: Wedding decorations can be made more lively and fun through the use of wedding props. They include a huge range of articles, from lamps to wedding trees, table tops to lights, and look very elegant and decent. Decoration is a paramount in marriage and wedding props play a significant role in the decoration of a big fat wedding. Attractive Wedding Lights: Lightning system breathes an actual life into the wedding décor. It plays a major role in setting your mood. 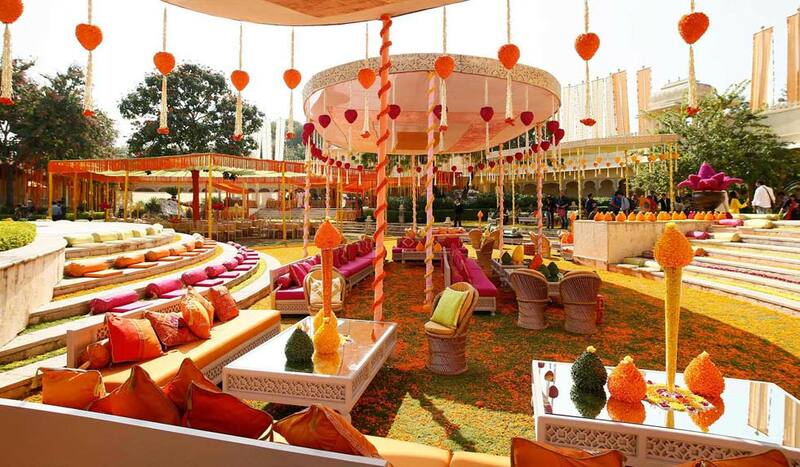 Traditional Wedding Decorators are well versed with the use of lights. Generally, a wedding decoration includes multiple work of lights like: table lighting, wall lighting, vase lighting, twinkling lighting, firework lighting, wire tension lighting, flower lights on tree tops, candle lighting, oil lamps, hanging lighting, cascading of bulbs, and pool lighting. Furniture: Furniture is an accessory which contributes significantly on deciding the theme of a wedding. A graceful and elegant furniture, either made out of metal or wood, is supreme among all the other factors of decoration. Every premier and expert wedding designer offers a broad collection of furniture available with them, depending upon different various themes. Floral Accessories: Indian weddings have a long convention of adorning the wedding venue as well as the spouse with flowers. These days even bride like to embellish themselves with different kind of accessories, such as floral jewellery. Bollywood most loved super stars like Shilpa Shetty and Aishwariya Rai Bacchan had donned floral jewelry on their wedding day. Flower accessories have other important aspects, for example, they are used to decorate the baggi of car as well. So, if the wedding bells are ringing at your home, you can use this guide and make your wedding decorations the talk of the town!